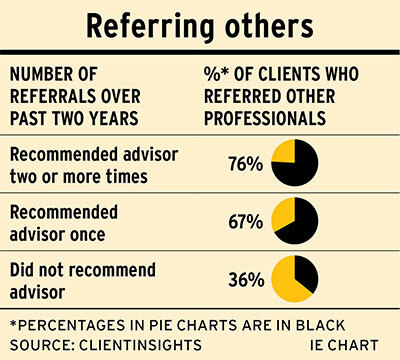 Historically, referrals have been the primary way in which financial advisors attract new clients. And those referrals came relatively easily as a reward for doing a good job for existing clients. But times have changed. When I talk with advisors today, I hear a different story: many talk about referrals “drying up.” Industry data backs this up. The Financial Performance Study of Advisory Firms, a 2016 study of advisors in the U.S., found that client referrals represented less than 2% of assets under management (AUM) in 2015. Furthermore, to increase AUM, referrals were significantly less important than the combined AUM from a variety of other business-development techniques. Some clients remain scarred by the “near death” experience of 2008. At one roundtable with investors that I hosted recently, several participants said that even though they liked and trusted their advisors, they would be cautious about referring friends. The reason came down to the responsibility that would come with making those introductions and the risk of jeopardizing friendships should we see another sharp drop in financial markets. Added to this concern is the fact some clients who referred friends and family to advisors in the past reported that the friends felt pressured to meet the advisor. Even for clients who now deal with a different advisor, that memory still may make them overly cautious. Even if your clients are happy with the job you do and the relationship you have with them, that isn’t always enough to lead to an enthusiastic referral. One reason for that lack of enthusiasm is that many advisors are perceived to operate very similarly, using words to describe how they operate that are indistinguishable from the terms used by other advisors. This is no different from recommending your accountant or lawyer to a friend. Even if you’re happy with your accountant, if you feel that the job he or she does for you is fundamentally no different from what other accountants would perform, you’re less likely to provide an enthusiastic referral. Finally, there’s the reality that most investors with significant investible assets either are working with an advisor or have worked with one in the past before deciding to manage their money on their own. As a result, there are fewer investors actively looking to move. We also have to add the impact of buoyant markets. In January, I spoke with an advisor who said that prospective clients are reluctant to change what they’re doing because markets have been strong since 2009. However, when we hit an inevitable correction, a flood of investors will be looking to move. Of course, that depends on the nature of the correction. A sharp pullback may cause investors to pull out of the market entirely, similar to what we saw some clients do in 2008. Most advisors instinctively recognize the importance of reducing the risk for clients in making referrals. That’s one reason why some self-styled “referral experts” urge advisors to get clients to talk about the value you provide. But there’s a second, more fundamental issue: for clients to talk about the distinct and unique value you provide, you first have to provide distinct and unique value. One key is focusing narrowly on the clients you work with and the problems that you solve for them. By making the transition in your business to become the safe choice for the clients you serve, you reduce the risk for clients to provide referrals to other members of your target community. Remember, clients don’t make referrals to help their advisors; they make them to help their friends. As an example of an approach to become the safe choice, one American advisor focuses on owners of automobile dealerships. Among other tools to address a key risk for these auto dealers, this advisor developed a proprietary portfolio that underweights consumer cyclicals and auto stocks. Another advisor concentrates on owners of mid-size businesses and hosts breakfast sessions twice a year to which he brings outside speakers to discuss hot-button topics, such as best practices for hiring online, increasing employee retention and ways to reduce the risk of employee litigation. When you read advice on referrals, there’s lots about the advisor’s role in making referrals happen. What’s seldom mentioned is the role the client’s mindset plays in making referrals happen. A research study I conducted in 2012 sheds important light on how different clients respond to the same conversation. This study gathered in-depth information from 500 clients. When asked how many times they’d introduced their advisor to friends or family in the past two years, the answer from slightly more than half of survey participants was “none”; from one in five, the answer was “once”; and 25% of participants had made two or more introductions. When asked whether their advisor had brought up the topic of referrals, 19% of those who had not made introductions said their advisor had mentioned it, vs 22% of study participants who had provided multiple introductions. The next hypothesis was that clients who provided referrals were more satisfied with their advisor’s performance. But, again, there were no meaningful differences among clients who’d made multiple referrals and those who had not. – You need to give referrals greater importance when identifying your most valuable clients. Clearly, referrals are your most important form of non-financial compensation from a relationship. When you segment clients in terms of the communication they’ll receive, ensure that you give “high-referral DNA” clients – those who provide referrals – the recognition they deserve. – Make referral recognition a priority. I recall talking to a client who’d referred a family member, but was annoyed that she hadn’t gotten so much as a “thank you” from her advisor. Conventional wisdom is that advisors need to raise the subject of referrals with their clients. Most advisors long ago moved past the pressure-based approaches of the 1970s. That being said, there’s a cottage industry of referral coaches who expound the view that to maximize referrals, you need to have clear conversations with clients about your value and about the benefits that they have experienced in working with you. Conversations that you initiate regarding referrals are much less important than a reading of our industry’s “referral literature” would lead us to believe. Yes, reminding clients periodically that you’re open for business and would be happy to talk to their friends does make sense. Given that research by the U.S. Financial Planning Association found that 75% of new clients didn’t previously have an advisor, it might make particular sense to let your clients know that, should someone they know be managing money on his or her own, you’d be happy to talk to them. But once you’ve raised this matter a couple of times, don’t make these conversations a source of anxiety for you or your clients. In particular, use your existing client communication as a low-stress way to raise awareness of your services among people in your clients’ networks. One advisor achieves success by sending clients an email each Friday afternoon entitled “Your Weekend Reading and Viewing.” He sends links to an article and a video he has found helpful or enjoyed. The articles tend to be more serious and focus on financial issues; the videos are more lighthearted or thought-provoking. He has received especially good feedback on some of the upbeat videos that he has shared. After a while, this weekly email became a vehicle through which clients may introduce the advisor to their friends in a way that is comfortable for both the clients and their friends. By sharing these emails, clients implicitly recommend the advisor to their networks – and, over time, this advisor began getting calls from prospects who had been getting his emails. Indirectly, what began as a vehicle to stay top of mind with clients became a way to get low-key introductions to his clients’ networks. Dan Richards is CEO of Clientinsights (clientinsights.ca) in Toronto. For more of Dan’s columns and informative videos, visit investmentexecutive.com.